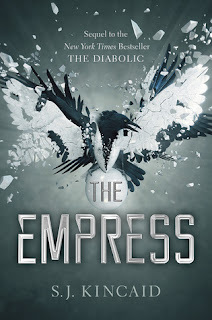 This month, I'm featuring The Empress by S.J. Kincaid! The Empress is the action-packed sequel to The Diabolic, one of my favorite books of 2016. There are so many science-y topics that I could pull from this book - from extraterrestrial non-human beings, to robots, to space travel and colonization, to galactic empires. But I'm going to do a tangential topic that I find fascinating. In this book, Nemesis and Tyrus travel across the galaxy to find an immortal being who is crucial to their success and acceptance as Emperor and Empress. There are many dangers in finding this being - including the black hole near the planet that the being resides on. Today, I'm going to talk about black holes! I find black holes incredible. I can't even imagine something so powerful and intense existing, and yet, they do! I would love to travel in space if only to experience a black hole from afar off (because it can't be seen). We can't see black holes, which is kind of sad! But we can detect them based on the behavior of stars around the black hole. Telescopes can see the light of black holes that humans cannot. There are a ton of theories surrounding black holes, since they are very difficult to study. One such theory that Kincaid uses in this book is that time slows down near black holes. This could be true! Albert Einstein came up with the theory of general relativity, which speaks to this phenomenon. Part of the theory of general relativity is the quantum field theory in curved spacetime; there is a lot of physics involved in all of these concepts, but basically, because of the curvature of spacetime around the black hole, light has to travel a greater distance near a black hole. But the speed of light is constant. So time must slow down to compensate for the great distance. Is that neat? I think it's neat. No need to worry about the Sun turning into a black hole, or Earth being swallowed by a black hole. If a black hole ever approached our Solar System, the planets would simply revolve around the black hole like they do the Sun. We're good! Thoughts on black holes? What are some phenomena in space that you find interesting? If you could travel in space, what is one thing you'd want to see or experience or investigate? That first pic is amazing (and a little scary). I think they're fascinating, and would love to see one (from a safe distance). But the fact that they can't be seen... wow. Pretty wild. Interesting about Stephen Hawking. I didn't know that. If it turned out they DIDN"T exist, then it would be VERY interesting to see what it is that accounts for that behavior! I have been interested in space for a long time and love watching those Discovery channel shows and conspiracy shows. That said, I would want to travel at the speed of light and visit other solar systems and other galaxies! What a great topic! I know a little about black holes and they really do give you something to think about.